It is a truth universally acknowledged that when it comes to all matters EU, Cameron - the cast iron Prime Minister - is not to be trusted. Yet he is also a man under political pressure not only from his own party but what he perceives as the UKIP threat for his general election chances. This is evident with his 2017 referendum promise which was made under duress while he had previously been anxious to avoid one at all costs. So as we enter the final straight leading up to May 2015 we had a much-hyped speech on immigration yesterday. Its purpose not only to try to win the election but form the basis of winning an EU referendum in 2017. In his speech we had the typical Cameron flourishes which were a rehash of his "commitments" over the Lisbon Treaty. With Lisbon he was repeatedly asked what would happen if it was ratified by all member states before he came to power. "We won't let matters rest there" was his response, which as we all know, letting matters rest there was precisely what he did. A U-turn that almost certainly cost him the 2010 election. Yesterday we had a variation of the same theme. If our concerns fall on deaf ears and we cannot put our relationship with the EU on a better footing, then of course I rule nothing out. Cameron repeated the "I rule nothing out" during the questions and answers session which followed his speech. Cameron hinting he would consider exit but not actually specifying it and we think it's fair to assume that he won't. However the more interesting point concerned how Cameron was going to attempt to wriggle himself out of the hole which he has very firmly plonked himself in, namely that any reforms to satisfy eurosceptics needs treaty change and that can't be done in the two years he proposed, if at all. Cameron: The answer to the second question is yes. These changes taken together they will require some Treaty changes. There’s a debate in Europe about exactly which bits of legislation which bits of the Treaty you’ll need to change but there’s no doubt this package as a whole will require some Treaty change. And I’m confident we can negotiate that. Such arguments have been made often on the internet so it's refreshing to see Cameron finally and publicly coming to the same conclusion. It's also interesting that his numerous references to Open Europe effectively outs it as the europhile organistion that it is and that its own purpose is to keep the UK in the EU. What the Prime Minister has done is narrow down the "reform" spectrum to cover one subject, and one subject only – immigration. To be more specific, it has been narrowed down to freedom of movement. This has a number of positives for Cameron. By linking the freedom of movement to the issue of benefits, has made Cameron try to look somewhat tougher on both. Then by concentrating largely on immigration he's turning his fire on UKIP. With UKIP exiting the EU arena and going for the anti-immigrant vote as its sole purpose, topped off by an all round aggressive undertone that by Farage's admission alienates half the electorate, it's an understandable strategy from Cameron. It's not the definite "ins" or the definite "outs" which matter, it's the more sensitive "don't knows", "couldn't care less", and "could be persuaded either way" votes which win a referendum. Thus by proposing what "appears" to be more a moderate sensible solutions to a concerned electorate rather than one of a more robust and alienating policy of repatriation (nevermind confusion) it would leave UKIP with nowhere else to go. It's a similar scenario to countries such as Cuba whose economy used to rely mainly on one export- sugar. Any failure for whatever reason in the product and you're buggered. ...Article 48 – which deals with treaty change – also allows for a "simplified procedure". Potentially, this would allow the procedure to be completed on a rainy afternoon in Brussels, perhaps on the margins of a European Council. There is, though, a small condition. The changes permissible are confined to Part Three of the Treaty of the Functioning of the European Union (TFEU) which, just as it happens, include freedom of movement. Against all the odds, therefore, Cameron could pull off a quickie treaty and come home in triumph, waving a piece of paper. What we can see here therefore is Cameron relying on the rather misleadingly named "self-amending" parts of the Lisbon Treaty. He will attempt to return from 'negotiations' claiming he's reformed the EU via Article 48, in this Cameron is attempting to do "a Chamberlain". It's as transparent as it's dishonest. However there are also some significant negatives with Cameron's strategy. The hurdles for Cameron are not over. Article 48 is limited to what it can and can't do and it cannot just change the Treaty of the Functioning of the European Union (TFEU) on a whim as and when, despite some of the eurosceptic rhetoric. In short it means Parliament always agrees to amendments unless it specifically objects within a certain time period. Therefore as we can see from Article 48 the key point is that Parliament still has a say in any potential amendments to the Lisbon Treaty. We needed an investment Budget to deal with the problems of training in industry, a Budget that would pave the way for negotiations to enter the European monetary system [ERM], a Budget that would do something about the problems that industry now faces, with investment flat and falling away. While permission from the UK parliament maybe assured, Cameron also requires unanimity within the European Council as this Parliamentary document makes clear in its conclusions; "...any Treaty revision by means of simplified procedures, and any changes to decision procedures by means of passerelles, will be subject to veto by the Government in the European Council or Council of Ministers." Thus initially Cameron has to have the approval of the other 27 member states, via the European Council and then via their own respective individual parliaments as well. Here we can probably expect likely objections to Cameron's proposal to limit immigration to come from countries such as Poland or Romania both of which have a veto (a proper one unlike a phantom one). Another difficulty for Cameron is, and one that has always been present, if the UK requests too much then it leads to other countries demanding concessions as well. And has always been the way through the horse trading (and consensus) which typifies EU politics the UK will give up more than it achieves. So it is more than likely that Cameron's package will be whittled down to non committal "declarations", "protocols" and "technicalities". All accompanied by theatre, marching bands and cheerleaders...but no substance. Wilson's "New Zealand butter" writ large. All helpfully promoted by our europhile media. Those who argue that Norway or Switzerland offer a better model for Britain ignore one crucial fact: they have each had to sign up to the principle of freedom of movement in order to access the single market and both countries actually have far higher per capita immigration than the UK. Which seems to suggest the Prime Minister knows full well (or has been informed by one of his constituents) that we can have single market access without being members of the EU, thus removing ourselves from the political union baggage which he claims he wants to do. It appears that we are beginning to establish the Norway option within the public debate. Rather incoherently he then argues that EEA membership is not an acceptable option because it has to sign up to the principle of freedom of movement, but at the same time argues that within the EU and the single market he can negotiate restrictions. A claim that becomes even more absurd when the EEA agreement, under Articles 112-3, allows greater scope to place restrictions on immigration. And further danger emerges for Cameron that by narrowing his reforms down to one issue he risks alienating those who wish "further and deeper reforms" such as big business represented by the likes of the CBI or members of his own side. It's also a tacit admission from the Prime Minister that he has somewhat painted himself into a corner - he has nowhere else to go either. With this in mind we increasingly wonder if Cameron has simply just changed the hooks on which he has impaled himself and in this he is entirely beatable. Being that 2017 in mental terms is now 'the near future' it's reasonable to theorise beyond the Referendum in the case that the contrived terms are sufficient to convince the UK electorate to endorse continued membership. Even by voting to remain in, the contradictions and inadequacies of the EU will remain, and the institutions and justifications behind them will continue to decay. Just by voting to stay in won't make the EU any more coherent or workable - as far as I'm concerned, it will still fall apart in chaos. Those observers who actually know what they're talking about will highlight that EU membership is still the ultimate resort of the politically insane and the logic to that is to continue the campaign to withdraw. 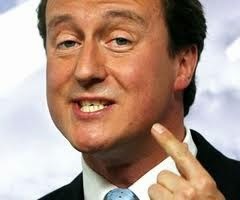 I'm sure Cameron thinks he's being jolly clever by evading the points at hand. After an 'In' result, the anti-EU campaign will therefore continue, business as usual. Agreed...the EU isn't finished in terms of its final destination so it is a moving target. This means that issue cannot remain settled while the EU keeps on integrating, especially when we consider the "referendum lock". Sorry - should really declare identities under 'Anonymous' - Douglas Carter as previous post. I can't blame the Scots for taking the opportunistic route - it was a literal insanity freelancing Gordon Brown to change the terms of the referendum half-way through voting - the people sending in a postal vote in advance of Brown's intervention were voting in a Referendum which no longer existed on the final day. Some observers noted at the time there was no evidence his panicked reaction had any influence on the eventual outcome. Scots Nationalists are entitled to draw exactly the opposite conclusion since an intervention is made quite specifically to influence an outcome. I get no self-awareness from the Cameron\Brown\Murphy axis (if you take my point there) that the fault that the Nats' campaign has not been stalled is entirely down to their own stupidity immediately in front of the finish line. That ought to be a lesson for the custodians of the EU Referendum - the whole thing needs to be crystal-clear well in advance of the poll itself - and changing the terms of the debate half way through the Campaign will simply guarantee they settle nothing on a permanent basis. Cameron's basic error in all this is that he forgot an old adage: when in hole stop digging. On a serious note, it's obviously hard to quantify influential impact, but it seems to me to be more than coincidence that Cameron has refrained from specifying the "Norway fax" meme ever since. My observation thus is that your meeting in August had a significant impact. And agreed completely on digging holes. ...if he has indeed accepted that the myth that Norway has no influence, would it not be the case that any representative of a Government led by him would also need to be slapped down if they themselves continued to make that erroneous claim? For example, imagine if his own Deputy Prime Minister carried on using the claim - you'd think Cameron would want to bring him in for a re-briefing, wouldn't you? I think not, Cameron has clearly lost control over the lies, distortions and misrepresentations Clegg is now using in the run up to the General Election, as he desperately fights for the life of his party which has been so conclusively trashed by his leadership and the incompetence and dishonesty of his MPs and MEPs. We all saw what Clegg's legacy was in the EU election and we can expect the same whipeout in the General Election as his voters return to their natyural homes as either Tory or Labour. Norway's position has been misrepresented consistently by the main parties and also by the racist claims of Ukip in relation to immigration, where not being in the EU but with the benefit of EEA membership has left Norway and for that matter Switzerland with around twice the levels of immigration that Britain has experienced, despite our Commonwealth affiliations! Facts and due dilligence have never been the forte of Ukip and Clegg & Farage would both seem to be willing to make any claim for publicity and self aggrandisement. 'Any claim' is right. Have a look, for example here on 'Liberal Democrat Voice'. Well. No he hasn't. Never. Not once. Not 'clearly' nor even in language which can be credibly interpreted thus. But of course it suits both the LibDems and the Tories to project their own preferred meaning onto the ambiguous guff that Cameron continues to emit. Penny Mordaunt: Debasing The Political Debate? UKIP MEPs Falling Out With Farage? Removing The UK From The ECHR?